All of the entry’s you have gathered up are so pretty, but I especially love huge pieces in an unexpected place like a huge mirror or painting in a small space. Makes it grand, and the curtains on each side of the door? FABULOUS! Thanks for commenting Tanya! I really like the curtains too and mirror idea too! Wow! I love them all! 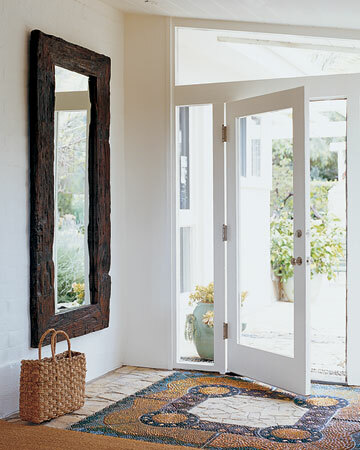 I read an article recently that showed lots of entryway options that all include a mirror (to check appearance on the way in or out), a narrow table (for seasonal decor), and a pretty dish or tray (for keys and such). I like that plan, too! Can’t wait to see what you design! 🙂 P.S. We also have a pretty coat/umbrella rack where guests can deposit their things, and it gets a LOT of use! Thanks for your reply!! I don’t know why I’m so stuck on this one. 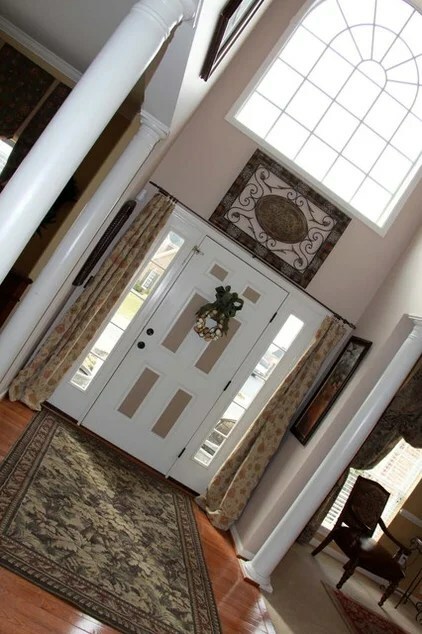 OK. On this entryway blog, I think you should definitely put up curtains on both sides of the door. My fav are the burlap ones that let the light peak thru. Also, the long lovely dark table with the various frames, lighting & candles on the wall. Thank you Dana! I’m leaning towards the curtains too! I love the curtains! I’m inspired… my list just happens to be long at the moment of projects I need to finish. 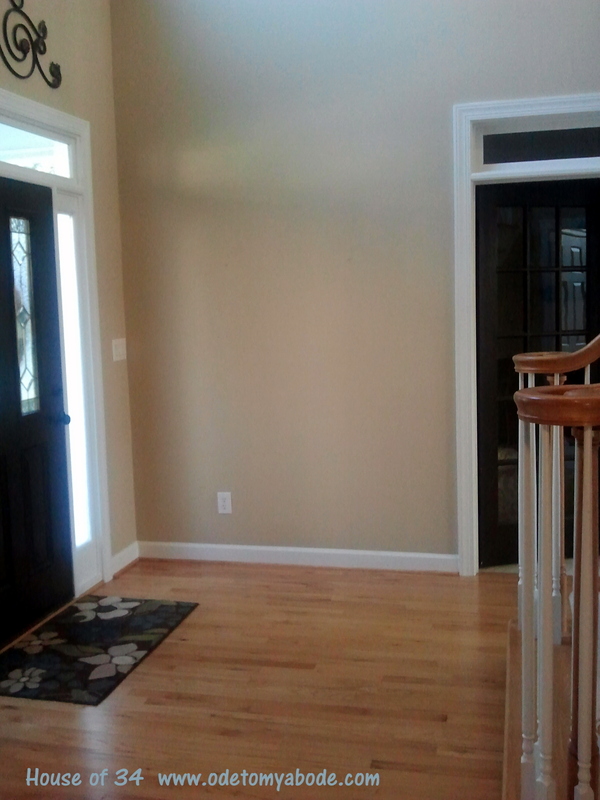 I have a weird entry though as the bathroom is right off the side of the door kind of behind you. I wonder if the curtains thing would work…? Hmmm…. now you ahve the thinking. 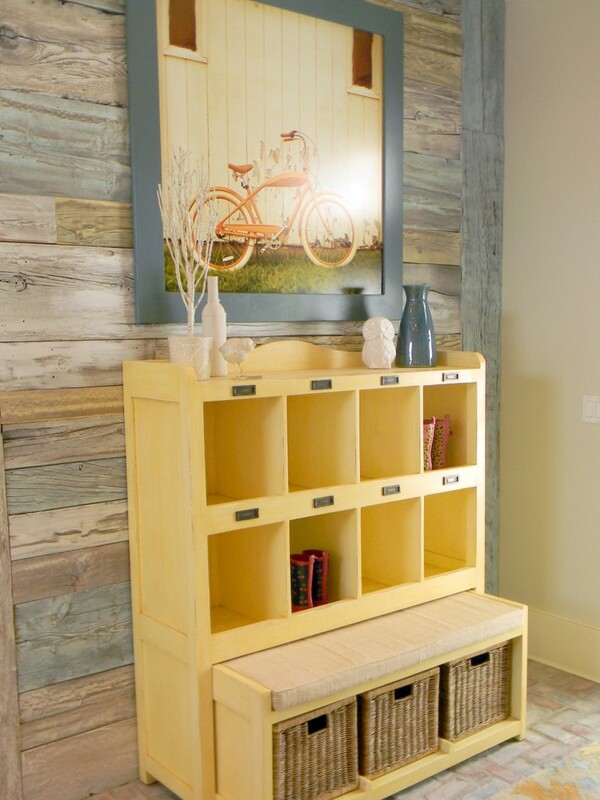 I love the cool wood too though- not the style of my house either, might need to figure out how anyway too…. If you do the curtains or the wood wall, please post it! I love the drapery panels also. A mirror is always a good thing so you don’t go out of the house looking weird. A tables great to so you have a place for keys. Entry ways are always hard. I look forward to what you come up with. Please share! I will definitely share the results! Thank you for commenting!